So for years, either I or my players would suffer fairly bad allergies at some point in the season, needing boxes upon boxes of tissues during a round because even decongestants and anti-histamines wouldn't be strong enough to tackle what we had going on in our nostrils. Tissues, as you know, are terrible for your skin if used for extended periods of time. Wiping away snot repeatedly dries out the skin, and then the tissue itself can become abrasive, with subsequent wipes of snot chafing sensitive, vulnerable nostrils. On top of that, wind and cold temperatures can aggravate the situation even farther, making for a very painful and uncomfortable Rudolph-the-Rednosed-Golfer situation. In competitive golf, these are distractions one just does not need. But until I became a mom, I did not know there was a better way to wipe snot away. Enter the Boogie Wipe. I don't know how I lived life without these. Babies are snot machines, but are incapable of blowing their noses. And the aforementioned problems with regular tissues in adults are even worse on the tender skin of babies. So the Boogie Wipe answers that problem by being a soft but durable cloth made with a saline solution that gently helps eliminate snot without drying the skin. And they are awesome. We buy them in bulk now from Amazon, because everyone in our family keeps a pack close at hand for whenever a runny nose strikes. Admittedly the toddler relies on me keeping them close by for him, but you know what I mean. Not only do they work well, but they even feel refreshing, which you never get from a regular tissue. That sudden, cooling sensation is such a nice pick-me-up when you're experiencing bad allergies during a round of golf . And while it's gross to think about, you can use one wipe two or three times without the wiped up snot getting all over the place. If you can't get to a trash can on the course and need to stick it in your pocket, it won't disintegrate into a million tiny, germ-filled pieces. Even better, they're great if you suddenly get dust or sand in your face, like if you have to hit into the wind out of a bunker. That way you can delicately wipe sand away from your eyes. I keep them in my bag now and can't imagine life without them on or off the course. 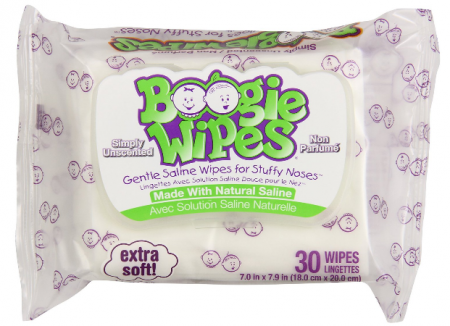 I wish I had known about Boogie Wipes as a coach, because these would have been my team's secret weapon during allergy season. I would have removed the label and tried to make them less obvious so the guys wouldn't feel so weird about using a baby product - but honestly I bet that as soon as they used them for the first time they wouldn't care. What other mom "life hacks" have you learned that can help on the course? I'd love to hear them! Disclaimer: I was not asked to provide a review, nor given any samples for free, nor affiliated with this company in any way, nor will profit from readers buying this product. I spent my own money on this product, and am nerdy enough to think it warrants a blog post about it.